The StoryTime Rocking Chair was designed by a dad of three who didn’t have a big enough lap for all his kids! Hal Taylor is a craftsman, a father of three, and probably a genius. He was experienced in the art of handcrafting beautiful rocking chairs, and when his brood went from two to three children, he had an epiphany. Everyone couldn’t fit in a traditional rocking chair for story time, a favorite activity among his little ones, but a rocking chair with three seats would be a lot more accommodating. Thus, the StoryTime Rocking Chair was born. Taylor’s inspired invention becomes even more so when you see it in action. Then, you wonder why rocking chairs haven’t always been made this way. The StoryTime Rocking Chair is not like any other piece of furniture. It’s like a regular rocker, but with two smaller seats – with their own backs and head rests – fused on each side, where armrests would traditionally be. The small side seats are perfect for small bums at story hour, allowing multiple kids to snuggle in for fanciful adventures in books. The chair is sturdy enough to support the extra weight, too, thanks to Taylor’s experienced craftsmanship. In an effort to share his creation with the world, Taylor made five StoryTime Rocking Chairs for the royal family in Abu Dhabi, and some of the photos featured here show the early models. 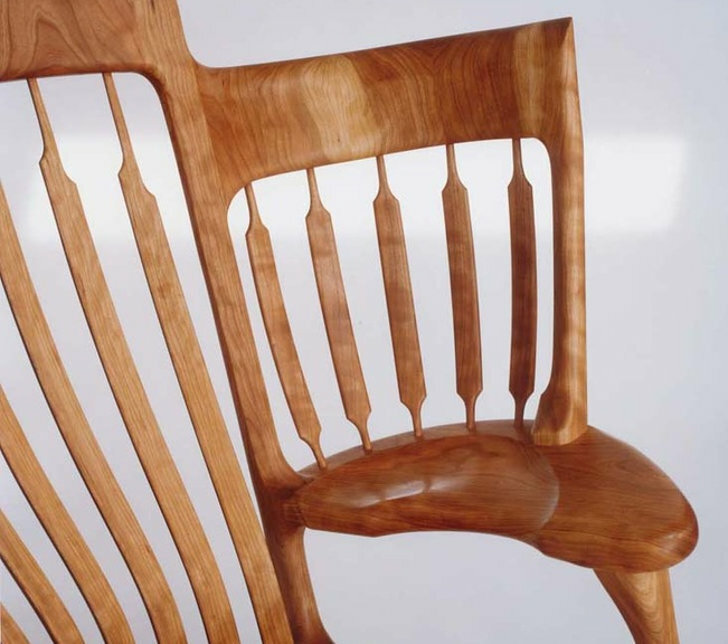 His work is so smooth and beautiful that the resulting three-seater rocking chair doesn’t even seem strange. The chairs retail for $7,000 to $7,500 and Taylor promises a perfect fit for your family. A piece of handmade furniture like this would certainly become a unique heirloom, too, for generations to come to enjoy — along with a good book.